Set to officially debut on the 21st August, Intel’s 8th generation of the Core series processors will finally be detailed for a public showing. Available for viewing on Intel’s Facebook page those looking to see if the amusingly named Coffee Lake processors will be worthy of their Starbucks membership card will be able to do so as the full line-up is revealed. While the next generation of CPUs won’t feature pumpkin spice sprinkles, whip cream toppings, or a cinnamon dusting, what they will have is an interesting change within the structure of all three performance tiers; i3, i5 and i7. Said to finally be moving away from the dual-core processor design, the 14nm – 8th generation Core i3 will be available in two choices, both featuring a quad-core design clocked between 3.6GHz and 4.0GHz. Known as the Core i3 8300 and 8350K, the latter as expected will contain an unlocked multiplier for manual overclocking. Confirmed to deliver a performance improvement up to 30% for laptop-based CPUs, how the Coffee Lake architecture performs on the desktop remains to be seen. Carrying a TDP of just 65W, this is clearly an incremental leap in energy-efficiency over previous generation products. Replacing the current Kaby Lake Core i5, both leaks and official confirmations detail two variants of a six-core i5 model; the i5-8400 and i5-8600K. These CPUs are said to contain clock speeds around 3.8GHz and 3.5GHz – boosting to 4.0GHz and 4.3GHz – the latter featuring an unlocked multiplier for user-control. Stepping things up to a 95W TDP on the unlocked variant, naturally, these will compete against the AMD Ryzen 5 series of processors, as both manufacturers move past the quad-core design in the Mid-range line-up. 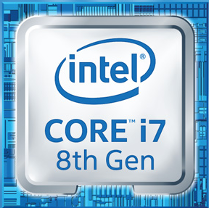 Residing at the top of Intel’s Core-i7 line-up sits the 8700 and 8700K. Both models are said to feature a six core/twelve thread design with base clock speeds around 3.2GHz and 3.7GHz, boosting to 4.3GHz with 12MB of Cache. If architectural improvements and IPC efficiency is anything to go by with prior generation CPUs, I for one, fully expect Intel’s Core-i7 series to offer an incremental improvement in gaming performance, pulling ahead of AMD’s eight core/sixteen thread Ryzen 7 CPUs. As far as motherboard support goes, this has been a subject of controversy. While most recent leaks have indicated that the 8th generation of processors will indeed work on existing 200-series motherboards, AsRock publicly stated that the new CPUs will require a new platform. This will have to be confirmed during the debut as surrounding information appears to be quite useless. We await the 21st of August.